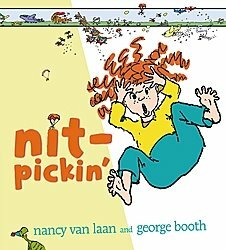 I don’t know, Nit-Pickin’ by Nancy Van Laan kind of offended me. It’s supposed to be a silly, musical story about getting head lice. Maybe the time has come for a humorous story about personal infestation–I’m all for stories that help kids deal with real problems–but did the family have to be hillbillies? The illustrations by New Yorker cartoonist George Booth had a lot of personality, but I saw too many stereotypes of our Appalachian countrymen for my liking. Everyone slathers home-grown concoctions onto the little girl’s hair until the dog is smart enough to go find some lice shampoo. The adults just pour mayo and kerosene all over her, seemingly not clever enough to figure out what the dog could. Words like “a-crawlin'”, “a-diggin”, “a-chucklin'” are all throughout the rhyming text. Everyone seems to have a twang. Gramps and Gramma look like they don’t have teeth, and while she makes collard greens Gramps says things like “Hush yo’ mouth!” Plus Gramps looks kind of like Jed Clampett or Yosemite Sam–bushy beard and mustache, old tattered hat, what looks like a flask in his pocket. And the main character’s little sister looks like a comb has never seen her hair. The implication, to me at least, is that certain kinds of people get head lice–and that’s okay. Would it have been more effective a story if the rhymes were made of proper words in the English language and the family lived in a penthouse on Park Avenue? Perhaps. Am I being overly sensitive about this one and it’s just meant to be a funny kids’ book? Possibly. But I read one small step for lice education, one giant leap for low income stereotypes.